My Beloved Crystal Ball, Will you Tell Me What Are The 2018 Lighting Trends After All? Wow Wow Wow, Let’s Recap! These days of waiting around for a divine answer are over! Walk with us while we unveil the hottest lamp ideias for 2018. But beware, this article might be too bright for your sensitive eyes, you might want to wear some sunglasses, ’cause we’re about to set this 2018 Lighting Trends Runway Show on Fire! Our customized Crystal ball predicts that in 2018, the lighting trends will be … going back to the classic mid century designs! 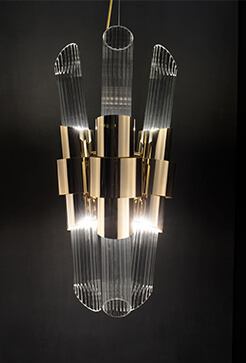 There’s no surprise that the mid century modern twist appeals to almost everyone and if you’re an interior design fanatic, but you secretly adore to watch Breakfast at Tiffany’s, then 2018 lighting trends will turn you into the happiest person alive! DelightFULL is going back to basis and rekindling their old mid century flame, ready to face 2018 with their finest and most refined artillery: their classic and iconic lighting design items! Oh I almost forgot, if you’re into floral and bold patterns, then you’ll be thrilled to know you’re praises have been answered and we’re in for some audacious and garden like atmospheres! New Year, normally calls for a new beginnings, new styles and new trends! Although, I have the feeling that fashion and interior design tend to walk in circles, differently from all the other spheres in life, these 2 dimensions are known from reutilizing and recapping, which can be good I guess! So, to honor this circular cycle 2018 lighting trends decided to grace us with a circular fever, which means this year we’re seeing all in round figures! Circular patterns? Check! Circular mid century Furniture and upholstery? Check! Circular Lighting?Surprisingly, check! After you make your complains, take a look at the full circular mid century environment below! Can you resist it? Ultra Violet is the trendiest color for 2018, but this comes as no surprise as it was Pantone itself who released this color, we didn’t saw it on the crystal ball! It’s impossible not to fall in love with this color, especially because it transmits a sense of mysticism and optimist, don’t you think so? 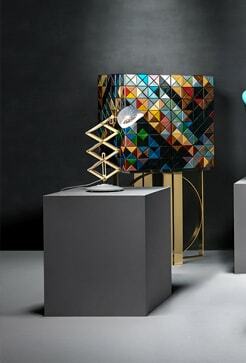 It might be a long shot and probably too hard to find, but there are certain brands that are producing some lamp ideas in the fanciest color of all! What would you say about a neon lamp featuring one go the 2018 lighting trends, ultra violet? 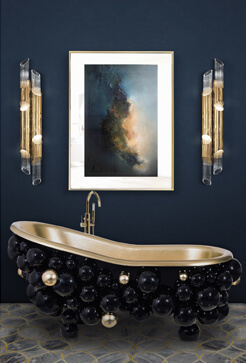 DelightFULL, one of the best mid century modern brands, has one and it’s the cosmic explosion you’ve been waiting to make 2018 the best year of your life! Once upon a time, the mesmerizing and imposing chandeliers reigned the lighting design World, leaving 0 or small room for other lighting categories to stand out. One day and as a glimmer of hope, the pendants that have had enough, felt it was their time to shine brighter than any other chandelier ever did! This was how the sumptuous chandeliers were overshadowed by the humble pendants, and lost their position in the 2018 lighting trends! This year, we’ll be seeing a lot of larger-than-life pendants, which fled from your house entrance right into your dining and living rooms, and let me tell you, the spotlight adores them! There’s always been an unending fight between golden and silver brass, and as the opinion aren’t unanimous it looks like it’s up to us to decide what will be featuring in the 2018 lighting trends. Will it be silver brass or golden brass? 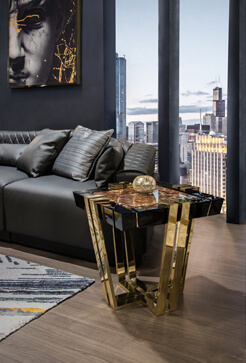 As we’ve ditched the crystal ball for something more plausible than that, we went to the some interior design gurus and after lengthy talks, they’ve decided it’s Golden brass who should rule this year! 2018 will be filled with golden brass finishing details, golden brass furniture items, but the most important of all, golden brass lighting design items! We really hope you liked our article. Feel free to pin all the images to your favorite Pinterest board or to print it and use in your mood board. 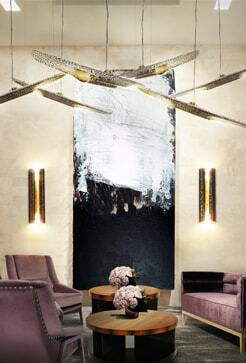 You can visit DelightFULL’s Inspirations page as well as our pinterest boards in order to get more inspirations about lighting designs, mid-century modern style, unique things in the world and so much more.